With the implementation of T3.1, Travian introduced player and alliance medals onto the servers. These are awarded each week to players who manage to appear and stay in the Top10 from Monday till Sunday. 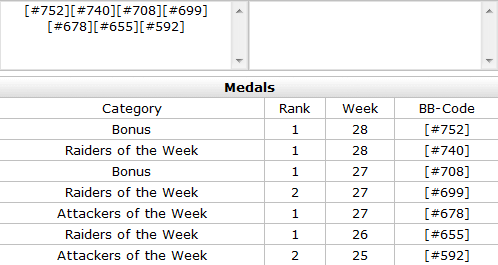 The Top10s are reset weekly on Monday at 0:00 am GMT. How do I obtain one? To earn a medal, you must be the best in one section that week. These medals are awarded for players who climb the most ranks in population. For the majority of the server, these are awarded to newly registered players who can jump from 21000 to 3000 in a matter of days, giving them a lead of 18000 climbed positions. However once registration is closed for a server (during and after artefact release), the medals are easier to claim by existing players increasing ranks by conquers and smaller population gain. Often referred to as the 'simmer medal', it isn't held in very high regard. These medals are awarded to players who have killed the most troops; it is calculated per crop consumption, not per unit total. So a player who kills 200 druidriders, will have a total of 400 kills, as the 200 druids ate a total of 400 crop. The kills can be accumulated through raids, attacks, conquer attempts, oasis captures and even attacking yourself. Your hero does not need to be present for the kills to count. If you look below, there is a possible hero's medal to be introduced in a later version of Travian that will encourage players to use the accompanying unit more often and earn medals purely for doing so. These medals are awarded to players who have killed the most enemy troops while defending their empire. It is calculated based on how many troops have died at your own villages and oases, not how many troops your own defence has killed elsewhere. Kills are calculated the same way as the attackers medal; by crop consumption of the unit rather than unit number. Your hero does not need to be present for the kills to count. Troops which die at the hand of your wall or residence/palace are included. But troops caught in your traps are prisoners, not dead, and will not have any effect on the total. These medals are awarded to players based on the cumulative resource total they are able to raid in 7 days. If the player is raided themselves and loses resources to another player, this is deducted from the cumulative total of resources gained. Players who view Top10 can see a negative number next to their name if they have failed to earn back the resources stolen from them. This plays a large part in the alliance raiders medal; also calculated cumulatively between all members of that alliance, if a member is repeatedly farmed, it is deducted from the alliance total. These medals are awarded for combination bonuses, when a player manages to be a top attacker and defender in the same week. They are not awarded to a player who owns an attacker and defender medal from different weeks. These medals were issued to players who turned up to the Travian Meeting in Hammelburg, Germany in 2009. The meeting was arranged by the headquarter and publicized on the .COM and .DE forums as an open invite event. There is a photo album documenting this meet which can be found here: [link]. The medals cannot be earned or awarded to anyone who did not attend this event. Here are the images used for alliance medals, exactly the same as player medals but with the added olive branches. Olive crowns symbolize a token of victory and are most commonly seen used in the Olympics. Only positions 1st - 10th are available to alliances, it is not possible for alliances to earn medals for being in the Top10 multiple times or achieving attack and defence in the same week.